I’ve been cooking/baking a lot with Macadamia Nuts. Sure, I’m slightly swayed by recent visits to Hawai’i but not only are these nuts delicious but they also have health benefits, too. Deemed a “high energy food” chopped with protein and fiber, these nuts are good and good for you. In an effort to mimic one of my favorite dishes from Asian Fusion restaurants, I decided to try my hand at lightly breading some tilapia. By mixing crushed macadamia nuts with panko breadcrumbs, I got a wonderfully crispy coating on the fish without that over greasy taste. A squeeze of lemon juice over the top and it almost had me feeling like I was back on the islands. Need a little Island flavor in your week? 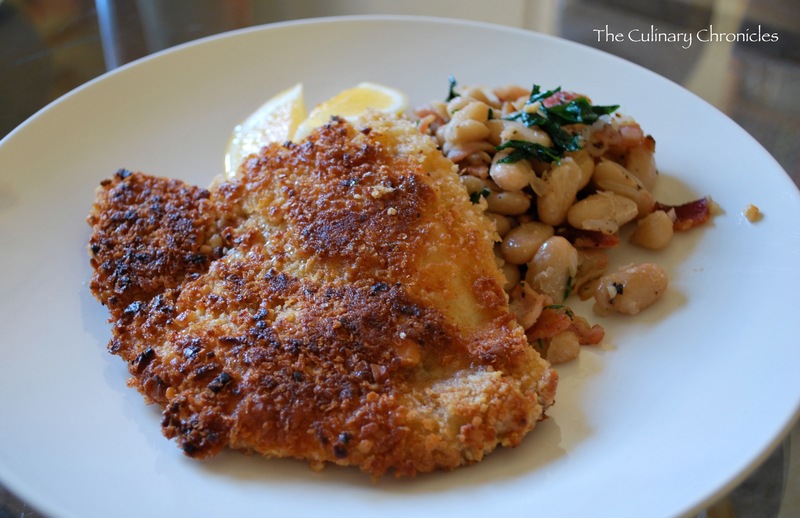 Try this Macadamia Crusted Tilapia…..quick, easy, and delicious! Create a dredging process. In one shallow bowl, place flour and lightly season with salt ad pepper. In second shallow bowl, beat large egg and combine with milk. In third bowl, combine macadamia nuts with panko breadcrumbs. Take first fillet of Tilapia and pat dry with a clean paper towel. Lightly season with salt, pepper, and garlic powder. Place in first shallow bowl and lightly coat with the seasoned flour, gently patting off any excess flour. Slide the fillet in egg mixture and lightly coat. Finally, transfer fillet to the last shallow bowl and cover thoroughly with the macadamia-panko mixture. Gently press the breading to the fish so that there is an even coat. Heat a large nonstick skillet on medium to medium-high. Add olive oil and carefully slide tilapia fillets in. Cook for 4-5 minutes on each side, until crust is golden brown and fish flakes by fork. Love Hawaii. 🙂 This looks delicious. What is the recipe for the white beans on the side? Hi Brooke! It was a simple saute of rendered bacon and then tossing it with the beans, a little lemon juice, S & P, and fresh herbs. Cheers!